More Bondora loan originations means even more origination data! After a slowdown in February, March saw an influx of borrowers from across the spectrum, and provided investors a great deal to think about for investing in Bondora peer-to-peer loans. Loan originations across all countries increased over the month of March, and it was loans out of Finland which led the charge. Finnish loans jumped above 53% of the total share of loans on the platform, originating a total of €5,234,375 on the month, up 49% from the previous month. 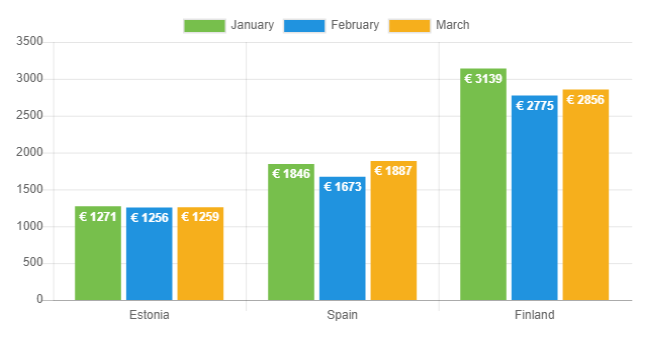 On the whole, Bondora originated 36% more loans than in February, for a total of €9,800,475 in March. Much of the share taken by Finnish loans came at the expense of C, D, and E rated loans out of Estonia which all lost more than 1% of their total share of originations on the platform each. The remaining origination distribution was in-line with previous months. After months in which average loan amounts decreased, loans from both Estonia and Finland increased in the average loan amount to new all-time high levels. The average loan in Estonia came to €2,249, while in Finland the average was €4,102. However, Spanish loans continue to see their average origination amount decrease for a second straight month, down just over 1% to €1,619. Meanwhile, average loan durations were also mixed, although with no major changes to note. Estonian loans remained at an average of 49 months for the third consecutive month, Spanish loans averaged one month higher to 44 months, and Finnish loans were down by one month on average to 55 months. After a month of down averages across the board, net income averages for borrowers rebounded in March. Net income in Finland averaged €2,856, up almost 3% from the previous month, and in Spain, net income averaged €1,887, up about 13%. Meanwhile, in Estonia, net income ticked up slightly higher to €1,259. Data regarding borrower employment status also improved in March, as more borrowers were employed for longer durations. Less than 20% of borrowers listed their employment status of up to one year, while over 66% have been employed up to 5 years or longer. Data for borrower home ownership status remained fairly consistent on the month. In Estonia, the most common status of borrowers, about 43%, was that of home ownership. Yet, this is not the case in Spain and Finland, where borrowers are more likely to be tenants. There was an increase in borrowers with unverified income in Estonia, up from 55% to about 70% in March. In Finland the verification trend stayed fairly constant, as 68% of borrowers were verified in March compared to 70% a month ago. In Spain, only 15% of borrowers had unverified income. Not only did Bondora originate significantly more loans over the month of March, it did so to borrowers who were, on average, more qualified than ever before. Income and employment data point to more qualified borrowers as a whole. As investors decipher this data they should feel more confident in their peer-to-peer loan investments on the Bondora platform. Even if you don’t know where to begin, first time investors can take advantage of Bondora loans by utilizing the simple and efficient Go & Grow investment service which provides an easy way to get started by automating the investing process.